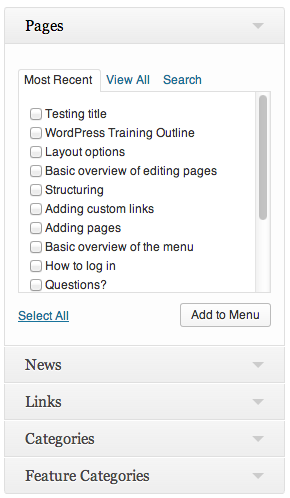 Most Recent – This tab will display a list of pages you’ve most recently edited or created. View All – This tab will display a list of pages sorted alphabetically. This section may have multiple pages, depending on the number of pages on your site. Search – The search tab gives you a text field for specifying keywords to locate. This is often the quickest method. Note: The keyword needs to exist in the title of the page, not the body text.